Western Blot analysis of HepG2 untreated and pervanadate (PVD) treated whole cell lysates probed with (A) Rabbit anti GSK alpha antibody (VPA00205) followed by detection with HRP conjugated Goat anti Rabbit IgG (1/10,000, STAR208P) or (B) Mouse anti GSK3 alpha (pSer21) antibody followed by detection with HRP conjugated Goat anti Mouse IgG (1/10,000, STAR207P). Membranes were treated with (+) and without (-) lambda protein phosphatase and visualized on the ChemiDoc MP with a (A) 75 second or a (B) 63 second exposure. GSK3 alpha (pSer21) has a molecular weight of 51 kDa. Normalized signal intensity of GSK3 alpha (pSer21) from PVD treated and untreated lysates, treated with (+) or without (-) lambda protein phosphatase. Lambda protein phosphatase dephosphorylates serine, threonine and tyrosine residues. Normalized signal intensity was calculated by dividing the TPN-Normalized signal intensity for each phosphoprotein by the TPN-normalized intensity of the corresponding total protein. 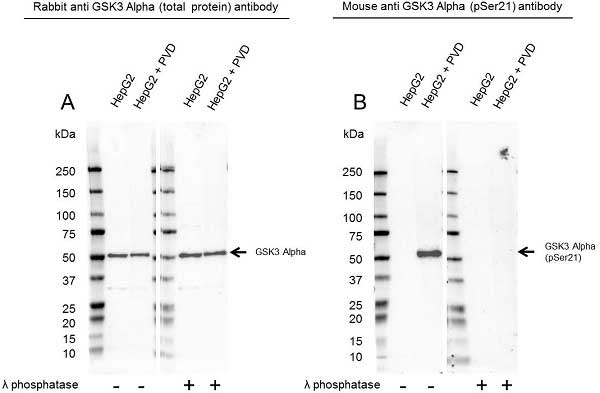 GSK3 alpha (pSer21) antibody recognizes glycogen synthase kinase-3 (GSK3) alpha, when phosphorylated at Ser21. Mouse anti GSK3 alpha antibody recognizes glycogen synthase kinase-3 alpha, also known as serine/threonine-protein kinase GSK3A, when phosphorylated at serine 21. GSK3 controls several physiological processes, such as modulation of transcription factor AP-1 (Nikolakaki et al. 1993) and CREB (Fiol et al. 1994) as well as glycogen metabolism (Welsh and Proud 1993). The kinase has also been reported to regulate cyclin D1 proteolysis and localization (Diehl et al. 1998). Phosphorylation of GSK3 at serine 21 leads to inactivation of the kinase (Frame et al. 2001) and is associated with poor survival chances in Acute Myeloid Leukemia (AML) patients (Ruvolo et al. 2015).